With new streaming music services, Apple and Google would be entering a very saturated industry. If Apple and Google debut streaming music services, they won't be guaranteed success. The tech giants will be entering a field already saturated with dozens of players, and industry experts say not everyone will survive. Fortune reported this week that Google (GOOG) is planning a YouTube subscription music service. 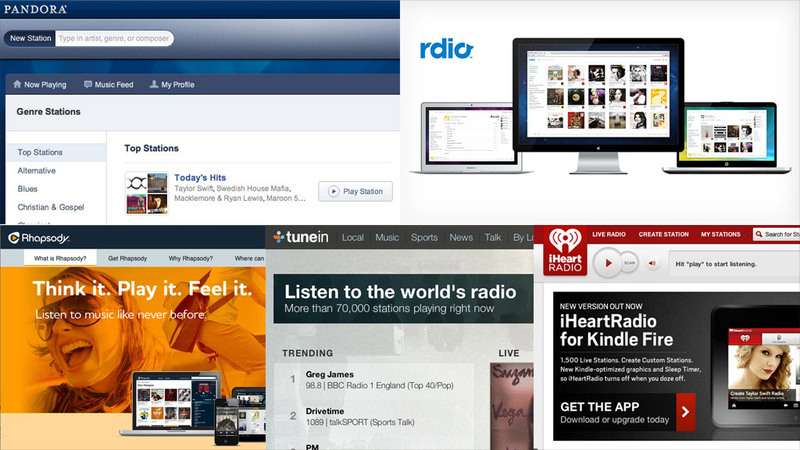 Apple (AAPL) is also reportedly negotiating terms with music labels to add a streaming option to iTunes. But their would-be competitors already make up an extremely long list: Pandora (P), Spotify, Rhapsody, iHeartRadio, Rdio, Mog, Muve and Daisy are just a small sampling. "The world does not need dozens of streaming services," says Russ Crupnick, a streaming media analyst at NPD. "There will be tremendous challenges to get some elbow room in the marketplace." Apple and Google could be well positioned to gain success in streaming music because of the companies' sheer size and brand recognition. But merely being a household name may not be enough. MySpace has fallen from grace, and Microsoft's (MSFT) Xbox Music debuted in the fall to mixed reviews. Napster couldn't survive its post-piracy life and sold to rival Rhapsody in December 2011. The big advantage Apple and Google have is the synergy with device businesses. Both could promote their streaming services as pre-loaded apps on iPhones, iPads, iPods or Android devices. Still, smaller companies like Pandora and Spotify have already carved out their own impressive subscriber figures. Pandora is the third highest-grossing app in Apple's iTunes App Store, driving significant in-app sales of music and premium services. Crupnick thinks Apple and Google have a shot at success, but the window of opportunity is closing fast: There will ultimately be between three and five successful streaming services, he says, "and it will be hard to name No. 6, 8, 10, or 25." Who makes it to that top-five list could depend on which companies can differentiate their services from the crowd. "The ones who have carved out a niche have done well for themselves," said Paul Resnikoff, the founder and publisher of the trade publication Digital Music News. "The jack of all trades approach usually isn't the best." For example, Leap Wireless' (LEAP) Muve Music service, available on all Cricket phones, now has 1.4 million subscribers. Leap says Muve is the largest subscription music service in the United States. Pandora, which had nearly 66 million listeners in January, doesn't break out numbers for paid subscribers. "[Muve is] an amazing grab on a very mobile focused, lower-income marketplace that no one else has tapped," Resnikoff said. Yet mainstream brands like Google and Apple are unlikely to settle for a niche audience. Marketing relevant music, events and advertisements to users could be a massively successful enterprise -- particularly for Apple and Google, who can easily leverage that information across their various existing services like iTunes and Google's giant advertising business. Despite the sheer amount of competition in the space, industry experts say the potential revenue opportunity makes the gamble worth a shot for Apple and Google. "That data is precious," Crupnick said. "If you know what I'm searching for ... you can feed me more ads that are more effective, and inform me about concerts and shows. Anyone who can unlock that could be a screaming success."